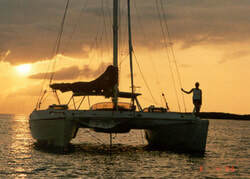 Sailing Adventures in Belize - "Our Belize Vacation"
Why book a tour through Black Orchid Management? Black Orchid Management, Ltd. has taken the time to research each individual tour offered on Ambergris Caye island. We have chosen, what we feel are the best tours available. This allows you as the guest, to spend your time being a tourist, enjoying your vacation, rather than taking the time to do the research that we have already done. aboard our beautiful Voyage 500 sailing catamaran "Infinity". We'll See You Soon - In Paradise! COME JOIN US IN PARADISE! 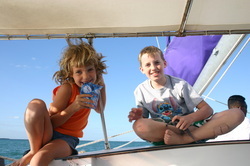 CATAMARAN CHARTERS - The Blue Hole! Dive in style and comfort! 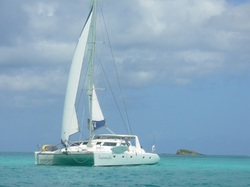 We are now taking reservations for our 50 foot catamarans. Sail out to the Blue Hole and the Lighthouse Reef Atoll and spend a couple of days, or maybe even a week. We will wine and dine you in style. This is the ultimate dive trip! Belize is home to the Belize Barrier Reef, the second largest barrier reef in the world. It is over 190 miles long, only surpassed in length by the Great Barrier Reef of Australia. Also the waters off the coast of Belize are home to three of the only four atolls in the Caribbean. All of these natural wonders make for a world class diving destination. "Infinity" is a fifty foot Voyage 500 catamaran capable of accommodating six guests in three cabins complete with en suite heads. Our yacht is affiliated with the best dive center on Ambergris Caye, a PADI Five Star Instructor Development Center. We can offer on board PADI Open Water and Advanced Open Water Instruction and certification, in addition to a great five aboard sailing and diving experience. Our dive gear is first class including integrated weight bcd's and dive computers. The crew of "Infinity" will take you to the Lighthouse Reef Atoll which is home to the famous Blue Hole, a circular sink hole one thousand feet in diameter and over 400 feet deep. This natural wonder was created thousands of years ao with the collapse of the roof of a cave. Jacques Cousteau made the Blue Hole famous in 1972, when he took his famous research vessel, the "Calypso", into Lighthouse Reef Atoll and traced a route that is used by dive boats to this day. Come join us for an adventure of a lifetime in the clear blue waters of Belize, aboard our beautiful Voyage 500 sailing catamaran "Infinity". Begin your day by sailing to Hol Chan Marine Reserve, where our guides will show you around the spectacular snorkel area. Then head on to Shark Ray Alley, where you will encounter sharks and rays in their natural habitat. Once back on board the board, you can rinse off in the fresh water shower and settle in for the sail to Caye Caulker. When you reach Caye Caulker, you will have time to explore our quaint sister island. After lunch, enjoy a leisurely sail back to San Pedro. INCLUDES: Beer, sodas, rum punch, and our famous homemade chips & salsa. WHAT TO BRING: Sunscreen, wide brimmed hat, sunglasses, camera, bathing suit, towel, dry clothes, money for lunch and to tip your guide (we recommend 15%). DEPARTURE TIME & LOCATION: Leave the dock around 9:00 a.m. and returns around 4:00-4:30 p.m.
We sail south towards Hol Chan Marine Reserve. Sailing smoothly down the island you can sit back, relax and watch as the sun sets on the pristine Caribbean Sea. After the sun sets, enjoy the view of Ambergris Caye as we sail up and down the coast, watching the starts come out and socializing. We arrive back in San Pedro at approximately 7:30 p.m.
INCLUDES: Beer, sodas, rum punch, water and snacks. WHAT TO BRING: Sunglasses, hat, camera, light jacket, money for tipping your guide (we recommend 15%). DEPARTURE TIME & LOCATION: Departs from the dock at 5:15 p.m and returns approximately at 7:30 p.m.